Russ is the Pulpit Minister for the Hillcrest Church of Christ in Baldwyn, Mississippi. Prior to taking the work at Hillcrest, Russ was the Pulpit Minister for the Middle Fayette Church of Christ in Fayetteville, GA. He was hired while the congregation was still meeting in a Middle School in Fayetteville in the winter of 2008.
for 12 years. Along the way, he has preached for the Gladeville Church of Christ in Mt. Juliet, TN. and the Cherokee Church of Christ in Cherokee, AL. as well as various smaller congregations on a part-time/fill-in basis doing local mission work. Russ preached his first sermon in the fall of 1987 sharing the pulpit with another young man during that time. Before becoming a full-time minister, Russ has served the Woodstock Church of Christ as a deacon over mission work. He has also served on the Board of Directors for the Woodstock Church of Christ Day-School as well as one of the Song Directors for the congregation. He also was a member of the Woodstock Church of Christ Education Committee. Russ earned a degree in 1994 from Kennesaw State University in Marketing and Professional Sales. 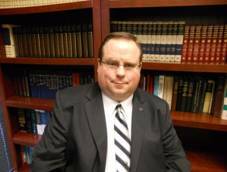 He has a degree in Preaching and Biblical Studies from the Nashville School of Preaching in 2006 along with numerous certificates from the Columbia Bible Institute in Columbia, TN. In 2010, he began working toward an M.A. from the Theological University of America majoring in Church History with minors in Church Leadership and Biblical Archaeology which was completed in the spring of 2014. Russ has served as the Atlanta Regional Director for the Gospel Broadcasting Network under the oversight of the elders of the Southaven Church of Christ in Southaven, MS.
Russ and his wife Jessica have been married for 19 years, and they have one boy: Bryan James Vickers, age 13. Russ is originally from Huntsville, Alabama and was baptized in the spring of 1984 by Bill Cantrell of East Huntsville. Jessica is a full-blooded Cajun born in Lafayette, Louisiana and she was baptized in 1991 at the Olive Street congregation (Piedmont Road) in Marietta, GA.